A.G.K. Menon, the conservationist in charge of preparing Delhi’s bid to be declared a World Heritage City by the United Nations, said on Tuesday that one of the city’s unique contributions to humanity was its hybrid personality formed over thousands of years — exemplified by its mix of architectural styles and its unique brand of Sufi mysticism. Judging by the crowd at one of the first public consultations on Delhi’s application, which has to be submitted by Feb. 1, 2012, he should have added “its rambunctiousness,” too. The draft dossier, now online, describes a plan to apply for heritage status for four historic areas of a city that has been the seat of empire after empire, most of which have left legacies still visible today. The four areas selected are 17th-century Shahjahanabad, or Old Delhi; the early 19th-century Lutyens bungalow zone; Mehrauli, which has monuments dating back to the 8th century; and Nizamuddin, home to a revered 16th-century Sufi shrine. After discussions with historians and officials, many areas and epochs didn’t make the cut, including the Raj-era Connaught Place, neighborhoods like 13th-century Hauz Khas, or ruins like Tughlaqabad, the city founded in the early 14th-century by Turkish ruler Ghiyasuddin Tughlaq. Mr. Menon and other speakers urged Delhi residents to actively participate in the application process. The crowd of intellectuals and students took those words to heart, beginning with Aman Nath, co-chairman of Neemarana hotels, which converts old palatial properties for contemporary use. British-built New Delhi, which was formally inaugurated in 1931, and now forms the center of the Indian capital, is widely known after British architect Edwin Lutyens. Together with fellow architect Herbert Baker, he is credited with designing and building the new capital of the Raj. Mr. Nath went on to say that if the city plans to honor British-built Delhi by the name of a particular architect, the same honor should go to the builders of Old Delhi — not to the Mughal emperor who had it built. Soon a conversation broke out: Should the Lutyens zone be renamed the Russel zone, after Robert Tor Russel, the architect behind Connaught Place and many buildings in the Lutyens’ zone, or even more generally, Imperial Delhi? A woman in the audience then questioned whether the Lutyens zone should be a heritage area when many of its buildings are off-limits to the public. Gagandeep Singh, a 20-year-old history student raised a different objection — about how the city’s historical monuments are described. Others wondered whether the heritage city designation would “freeze” the historical zones and what would happen to the people living there — should development around the sites be stopped or aloud to continue? That’s an ongoing tussle around historic sites in the city. Recent news reports suggest people living around the Tughlaqabad ruins are slated to be evicted, although some of them claim to have been living there for hundreds of years. Soon there was a fabulous chorus of people interrupting one another (quite politely, for a Delhi crowd) to interject, “May I say something?” Ah, Delhi. Tuesday’s event is part of an ongoing public consultation process that continues through next month, and will include both limited attendance seminars about each of the four zones and public lectures. 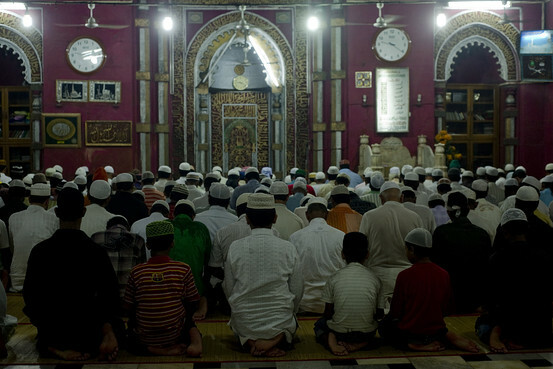 Picture: Nizamuddin’s Sufi shrine is among the four selected areas for “heritage status.” In the image above, muslims offered prays at the shrine in New Delhi, Aug 2010. Photo: Manpreet Romana/Agence France-Presse/Getty Images.